It may be almost done. So, it would be great if people here could take a look and comment on it! It’s a cool mix of probability theory and double categories. I’ve posted a similar but non-isomorphic article on the n-Category Café, where people know a lot about double categories. But maybe some of you here know more about Markov processes! 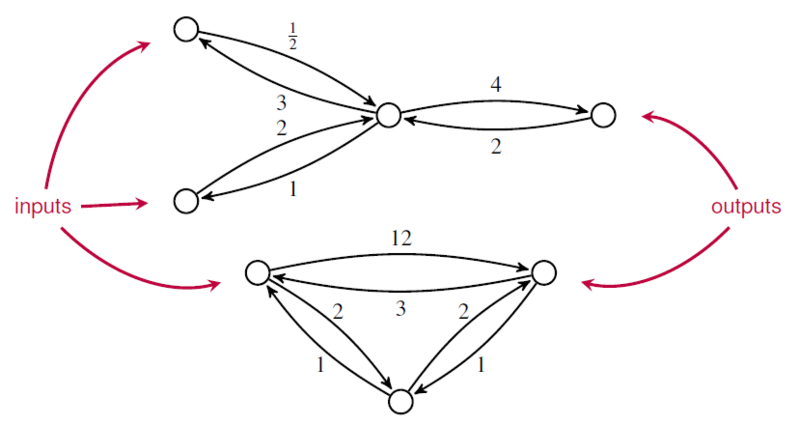 • tensoring, where we set two open Markov processes side by side. But before you dive into the paper, let me explain all this stuff a bit more…. where the number labeling each edge describes the probability per time of making a transition from one state to another. Open Markov processes can be seen as morphisms in a category, since we can compose two open Markov processes by identifying the outputs of the first with the inputs of the second. Composition lets us build a Markov process from smaller open parts—or conversely, analyze the behavior of a Markov process in terms of its parts. In this paper, Kenny extend the study of open Markov processes to include coarse-graining. ‘Coarse-graining’ is a widely studied method of simplifying a Markov process by mapping its set of states onto some smaller set in a manner that respects the dynamics. Here we introduce coarse-graining for open Markov processes. And we show how to extend this notion to the case of maps that are not surjective, obtaining a general concept of morphism between open Markov processes. Since open Markov processes are already morphisms in a category, it is natural to treat morphisms between them as morphisms between morphisms, or ‘2-morphisms’. We can do this using double categories! Double categories were first introduced by Ehresmann around 1963. Since then, they’ve used in topology and other branches of pure math—but more recently they’ve been used to study open dynamical systems and open discrete-time Markov chains. So, it should not be surprising that they are also useful for open Markov processes.. While a mere category has only objects and morphisms, here we have a few more types of things. We call and ‘objects’, and ‘vertical 1-morphisms’, and ‘horizontal 1-cells’, and a ‘2-morphism’. We can compose vertical 1-morphisms to get new vertical 1-morphisms and compose horizontal 1-cells to get new horizontal 1-cells. We can compose the 2-morphisms in two ways: horizontally by setting squares side by side, and vertically by setting one on top of the other. The ‘interchange law’ relates vertical and horizontal composition of 2-morphisms. In a ‘strict’ double category all these forms of composition are associative. In a ‘pseudo’ double category, horizontal 1-cells compose in a weakly associative manner: that is, the associative law holds only up to an invertible 2-morphism, the ‘associator’, which obeys a coherence law. All this is just a sketch; for details on strict and pseudo double categories try the paper by Grandis and Paré. 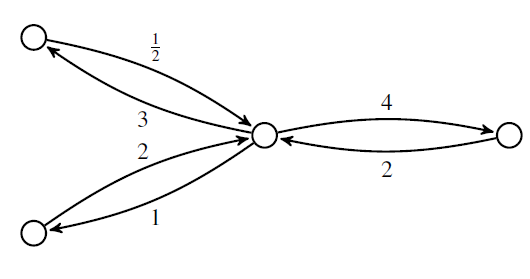 morphisms between open Markov processes as 2-morphisms. I won’t give the definition of item 4 here; you gotta read our paper for that! Composition of open Markov processes is only weakly associative, so is a pseudo double category. This is how our paper goes. In Section 2 we define open Markov processes and steady state solutions of the open master equation. In Section 3 we introduce coarse-graining first for Markov processes and then open Markov processes. In Section 4 we construct the double category described above. We prove this is a symmetric monoidal double category in the sense defined by Mike Shulman. This captures the fact that we can not only compose open Markov processes but also ‘tensor’ them by setting them side by side. As compared with an ordinary Markov process, the key new feature of an open Markov process is that probability can flow in or out. To describe this we need a generalization of the usual master equation for Markov processes, called the ‘open master equation’. This is something that Brendan, Blake and I came up with earlier. In this equation, the probabilities at input and output states are arbitrary specified functions of time, while the probabilities at other states obey the usual master equation. As a result, the probabilities are not necessarily normalized. We interpret this by saying probability can flow either in or out at both the input and the output states. If we fix constant probabilities at the inputs and outputs, there typically exist solutions of the open master equation with these boundary conditions that are constant as a function of time. These are called ‘steady states’. Often these are nonequilibrium steady states, meaning that there is a nonzero net flow of probabilities at the inputs and outputs. For example, probability can flow through an open Markov process at a constant rate in a nonequilibrium steady state. It’s like a bathtub where water is flowing in from the faucet, and flowing out of the drain, but the level of the water isn’t changing. Brendan, Blake and I studied the relation between probabilities and flows at the inputs and outputs that holds in steady state. We called the process of extracting this relation from an open Markov process ‘black-boxing’, since it gives a way to forget the internal workings of an open system and remember only its externally observable behavior. We showed that black-boxing is compatible with composition and tensoring. In other words, we showed that black-boxing is a symmetric monoidal functor. 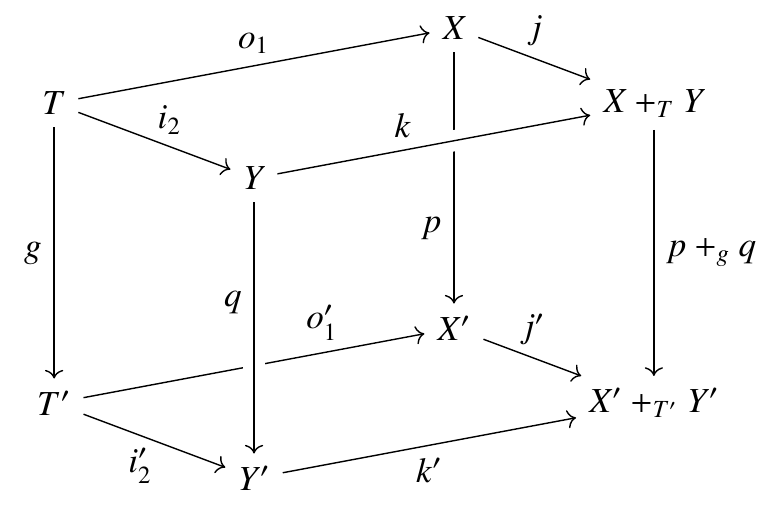 Here a ‘linear relation’ from a vector space to a vector space is a linear subspace . Linear relations can be composed in the usual way we compose relations. The double category becomes symmetric monoidal using direct sum as the tensor product, but unlike it is a strict double category: that is, composition of linear relations is associative. and the top and bottom faces are pushouts, and the two left-most faces are pullbacks, and the two left-most arrows on the bottom face are monic, then the two right-most faces are pullbacks. I think it’s cool that this is relevant to Markov processes! Finally, in Section 6 we state a conjecture. 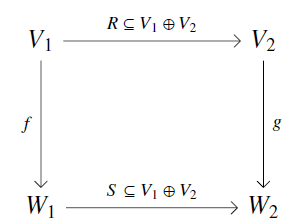 First we use a technique invented by Mike Shulman to construct symmetric monoidal bicategories and from the symmetric monoidal double categories and . We conjecture that our black-boxing double functor determines a functor between these symmetric monoidal bicategories. This has got to be true. However, double categories seem to be a simpler framework for coarse-graining open Markov processes. A matrix with these properties is called ‘infinitesimal stochastic’, since these conditions are equivalent to being stochastic for all . Clerc, Humphrey and Panangaden have constructed a bicategory with finite sets as objects, ‘open discrete labeled Markov processes’ as morphisms, and ‘simulations’ as 2-morphisms. The use the word ‘open’ in a pretty similar way to me. But their open discrete labeled Markov processes are also equipped with a set of ‘actions’ which represent interactions between the Markov process and the environment, such as an outside entity acting on a stochastic system. A ‘simulation’ is then a function between the state spaces that map the inputs, outputs and set of actions of one open discrete labeled Markov process to the inputs, outputs and set of actions of another. Another compositional framework for Markov processes was discussed by de Francesco Albasini, Sabadini and Walters. They constructed an algebra of ‘Markov automata’. A Markov automaton is a family of matrices with non-negative real coefficients that is indexed by elements of a binary product of sets, where one set represents a set of ‘signals on the left interface’ of the Markov automata and the other set analogously for the right interface. So, double categories are gradually invading the theory of Markov processes… as part of the bigger trend toward applied category theory. They’re natural things; scientists should use them. This entry was posted on Sunday, March 4th, 2018 at 3:55 am and is filed under mathematics, networks, physics, probability. You can follow any responses to this entry through the RSS 2.0 feed. You can leave a response, or trackback from your own site. Great intro for non math linguistically trained individuals. I only have to go look up a few new definitions from math to fully understand. This seems to be relevant to lots of engineering in existence now. A wireless channel over time with intended and unintended inputs could only activate the sparse framework needed in the moment and turn off branches that are not needed in the moment. Once the inputs detect needed state machine subcategories, they can be activated to allow optimization in the moment. A moving car cell signal as it goes from one cell to another is another example, each cell tower and cell phone could have this sparse in the moment, yet robust and full featured as needed. This would maximize efficiency with little hit to performance. Self driving cars are another, with the constant identification, significant power draw, and non-negotiable requirements. On a country road the computation needed is much less than in a city rush hour comparison. Mark-on with the Markov multi category progress. Captain Obvious here…Has anyone have more than two Markov categories in a triple or higher #? Is it just a matter of extension if yes? Started this yesterday after this post. https://github.com/Cobord/OpenMarkovTensorFlow. Will still need to implement composition of 1-morphisms and the 2-morphisms. Cool! If there were some way to show examples visually, rather than in code, that would be really fun for non-coders like me. It has some visualization now. If I coarse-grain it any more it’ll shrink to a single period. Is it correct that if you would have taken the same s as on page 11 in your pdf then there would be a 7 instead of an 8 as a label between the nodes w and y in the second diagramm in the image above (i.e. the twitter image)? Sorry, I don’t know what “the same s as on page 11” means. I don’t see anything called s there. There’s something called S, which is the set of inputs. With s I mean the very first letter in the text: i.e. the alleged “stochastic section” of the “function” p. I am not sure whether I derived the correct infinitesimal matrix H from your diagram above, but in contrast to the H in the paper (p.10) the corresponding “lumped” H’ of the diagram would depend on the choice of the probabilities (or weights?) in s. I derive H’ by multiplying H with s (where I actually replaced 1/3 with P and 2/3 with (1-P) in order to understand the dependencies on the probabilities P better) and then add row 3 and 4 of H.
and then add row 3 and 4 of H and then add row 3 and 4 of Hp. and then add row 3 and 4 of H \rightarrow and then add row 3 and 4 of Hs. for any . So, coarse-graining the Hamiltonian of a Markov process involves some summing. Coarse-graining is an approximation as it reduces dimensionality in the flow diagram at the expense of fidelity. If the rate of 4 that describes the w2 to w1 transition was increased to a very large number, the coarse-grain solution would result in the w to y transition asymptotically converging to 9. This is a basic form of order-reduction for stiff problems. OK thanks. Now I am more or less sure that I understand what you mean with the notation . By the way is Kenny reading the comments to this blog post? I don’t see what this have to do with stiffness problems, but if 4 gets big then with the above hamiltonian the w to y transition would converge to 9 only for a specific section. I doubt Kenny is reading the comments here. I’ll tell him about these comments. The image in the tweet was taken from back when we were originally considering more general coarse-grainings of Markov processes. Later on, for category theoretic reasons, we decided to only work with Markov processes that were lumpable, since lumpability is precisely the condition needed for the Hamiltonian of the new Markov process to be independent of the choice of stochastic section s. As you noticed, the image in the tweet isn’t lumpable (at least not in the manner that is being visually suggested) since the rates of the edges going from both of the states w1 and w2 to the state y are not the same. They are in the example in the paper. It’s also perhaps worth noting that the edge with rate 4 going from the state w2 to the state w1 plays no role in the lumped Markov process, which intuitively makes sense: anything in either of the states w1 or w2 will transition to state y at the same rate in the case where the original Markov process is lumpable, and transitioning between states w1 and w2 will not affect this. Later on, for category theoretic reasons, we decided to only work with Markov processes that were lumpable, since lumpability is precisely the condition needed for the Hamiltonian of the new Markov process to be independent of the choice of stochastic section s.
Frankly I have problems to see why this is a category theoretic question. In particular I haven’t sofar understood what this lumpability is needed for. I could have imagined e.g. that an internal lumpability might for example not change the relations between input and outputs of a Markov network, but I haven’t found a remark similar to that. I searched the text for all occasions of the word “lump”, but apart from the reference it didn’t appear in the text after theorem 3.10. I could have imagined e.g. that an internal lumpability might for example not change the relations between input and outputs of a Markov network, but I haven’t found a remark similar to that. 2) coarse-graining a state with and then evolving it in time using the coarse-grained Markov process with Hamiltonian . Since this is so nice, we build the equation into the definition of ‘morphism between open Markov processes’ in Definition 3.4. In the rest of the paper we study these morphisms and never mention the word ‘lump’. We need the condition to prove most of the interesting results in the paper. For example, Lemma 5.3. The literature on Markov processes talks about lumpability, but they usually use the equivalent condition (iii) as their definition of lumpability. It sounds like you’re talking about Lemma 5.3, which says that coarse-graining is compatible with black-boxing. Lemma 5.3: Given a 2-morphism [DIAGRAM] in Mark, there exists a unique 2-morphism [DIAGRAM] in LinRel. That is even if you tell me that “build the equation into the definition of ‘morphism between open Markov processes” I don’t see why Lemma 5.3. says “coarse-graining is compatible with black-boxing” and in particular what you mean with “compatible.” This seems to be hidden in those cryptic diagrams. But anyways I got now a rough idea of what you were doing here. Thanks for being so publicly confused about our paper; having worked on it for a year the meaning of the formalism has become obvious to Kenny and me, but you’re reminding me that a few sentences here and there could help explain its meaning. Lemma 5.3 is about what happens when we apply the 2-functor , which is black-boxing, to 2-morphisms in Mark, which are morphisms between open Markov processes. The simplest morphisms between open Markov processes are coarse-grainings. So, the Lemma says what happens when we black-box a coarse-graining. The simplest case is when the maps and in the diagram are identity functions. This means that we’re leaving the input and output states alone. In this case, Lemma 5.3 says that the relation between input and output probabilities and flows in steady state are the same for the original open Markov process and the coarse-grained open Markov process. I could have imagined e.g. that an internal lumpability might for example not change the relations between input and outputs of a Markov network. This is true if by “the relations between inputs and outputs” you mean “the relation between input and output probabilities and flows in steady state”. This relation is what black-boxing gives us. 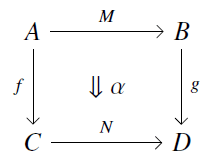 The double category formalism, with its supposedly cryptic diagrams, is just a way of drawing open Markov processes and the morphisms between them, e.g. coarse-grainings. With this style of picture, the coarse-grainings look like rectangles. The basic operations on coarse-grainings look like ways of sticking together rectangles to get bigger rectangles. The rules these operations obey turn into intuitive rules about sticking together rectangles. That’s the whole point of double categories. Double categories are “the algebra of rectangles”, just as categories are “the algebra of arrows”. We don’t explain this, because this paper was written for people who are comfortable with double categories. Explaining double categories would double the length of this paper. 1) We can compose coarse-grainings of open Markov processes “horizontally” by attaching the outputs of one to the inputs of another. 2) We can compose coarse-grainings of open Markov processes “vertically” by doing first one and then another: coarse-graining and then coarse-graining some more. We can stick together two rectangles either horizontally or vertically, and that’s how we draw operations 1) and 2). Some nontrivial laws governing these operations then drawn as obvious-looking laws about sticking rectangles together. • Eugene Lerman and David Spivak, An algebra of open continuous time dynamical systems and networks. • Kenny Courser, A bicategory of decorated cospans, Theory and Applications of Categories 32 (2017), 995–1027. • Florence Clerc, Harrison Humphrey and P. Panangaden, Bicategories of Markov processes, in Models, Algorithms, Logics and Tools, Lecture Notes in Computer Science 10460, Springer, Berlin, 2017, pp. 112–124.